Can Open-Government Models Contribute to More Collaborative Ways of Governance? The Greek political landscape and the way public administration and political procedures are performed is an ideal field of study of the enabling potential of the Internet to foster new, dynamic forms of democracy, introducing open and “citizen-friendly” forms of government mainly by functioning as a horizontal communication channel allowing polyphonic discussions as well as one-to-one dialogues. As Greece is facing the most intense social, political and economic crisis of her history, a series of political issues over the last decade have caused widespread public mistrust, civic disengagement and finally a deep feeling of disappointment for the inefficiencies of public administration while corruption is a major problem in the country. In order to face this credibility deficit, and following European Union’s recommendations and worldwide trends, the Greek government has initiated a series of open government initiatives in an effort to address the lack of accountable leadership. The objective of this chapter is to present the Greek OpenGov.gr case and its results as a top-down eParticipation effort. 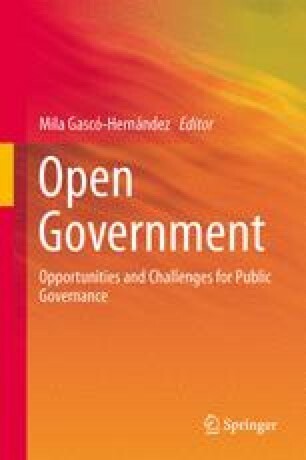 In parallel, this analysis intends to identify and discuss similarities, complementarities and differences between the concepts of eParticipation and open government in the sense that one of the major challenges for open government is to integrate a “deliberative-participatory element” into existing political structures and procedures. Deligiaouri, A. (2010). Open governance and e-rulemaking. Online deliberation and policy-making in contemporary Greek politics. http://microsites.oii.ox.ac.uk/ipp2010/system/files/IPP2010_Deligiaouri_Paper.pdf. Accessed 15th September 2013. DiMaio, A. (2010). eParticipation in Europe: living in a bubble? http://blogs.gartner.com/andrea_dimaio/2010/09/24/eparticipation-in-europe-living-in-a-bubble. Accessed 15th September 2013. Goulandris, V. (2010). Opengov.gr: The first 120 days of e-deliberation. http://onlinepolitics.wordpress.com/2010/02/22/opengovgr-first-120-days-e-deliberation/. Accessed 15th September 2013. Gouscos, D., & Staiou, E. (2010). Evaluation of the operational development of opengov.gr. http://old.media.uoa.gr/sas/issues/24_issue/07.html. Accessed 15th September 2013. Greek Government. (2010). Greek action plan for open partnership. http://www.opengovpartnership.org/countries/greece. Accessed July 2013. Internet World Statistics. (2013). http://www.internetworldstats.com/. Accessed 15th September 2013. Itamo, N. (2010). Greek prime minister fights “credibility deficit”. http://ypepth.opengov.gr/panaretos/?p=519. Accessed July 2013. Obama, B. (2009). Transparency and Open Government The White House. http://www.whitehouse.gov/the_press_office/Transparency_and_Open_Government. Accessed 15th September 2013. OECD (2013). Openness and transparency—Pillars for democracy, trust and progress—Speech of Angel Gurría, OECD Secretary-General. http://www.oecd.org/about/secretary-general/opennessandtransparency-pillarsfordemocracytrustandprogress.htm. Accessed 15th September 2013. Pateli, K. (2010). The narration on open government and Opengov.gr. http://old.media.uoa.gr/sas/issues/24_issue/08.html. Accessed 15th September 2013. Rigou, M. (2010). Open governance: the implementation of Opengov.gr. http://old.media.uoa.gr/sas/issues/24_issue/06.html. Accessed 15th September 2013. Transparency International. (2012) Corruption perception index 2012. http://www.transparency.org/cpi2012/results. Accessed 15th September 2013. Yannopoulos, D. (2010). The dawn of a new era. http://www.athensnews.gr/articles/13372/10/01/2010/24631. Accessed 15th September 2013.